Below is a graphic of Psalm 91 with the words changed to the first person. For example "I dwell" instead of "he who dwells". This allows you to pray the psalm to claim peace of mind within your own life. The original words are a powerful prayer to bless another. 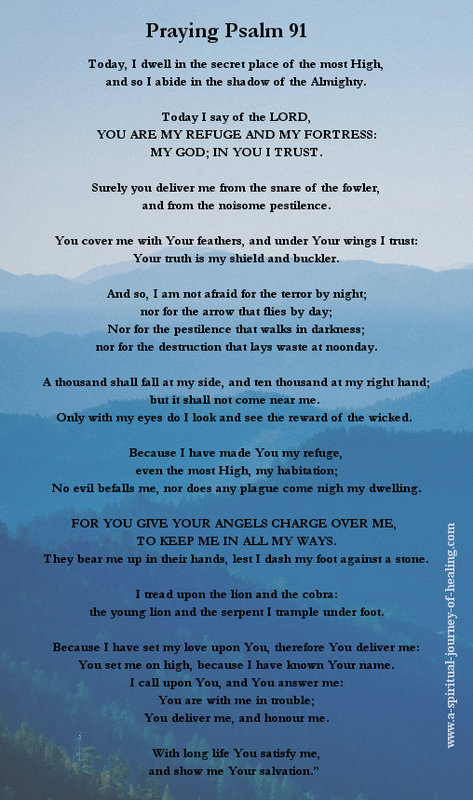 The above is available to buy as a Psalm 91 poster in my zazzle store. 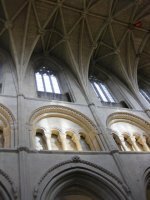 The previous article includes the original words to Psalm 91 along with advice about how to pray the psalm as a prayer for protection. 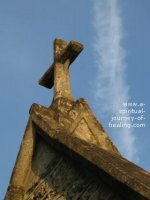 In this spirituality article, I look at how Psalm 91 can be prayed as a psalm for peace of mind. Do you believe that even when you have a problem, you can still touch a deep feeling of peace that comes from trust in God? The female eagle carries her young under her wings. Those young eagles may be flying with a huge drop beneath them. Yet they are safe and protected. 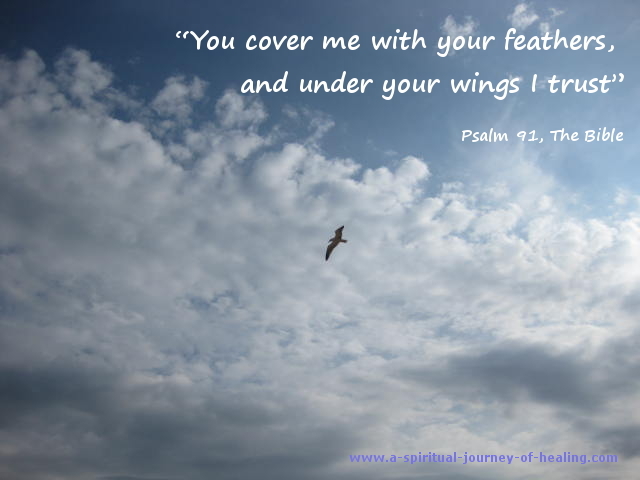 The meaning of Psalm 91 is that whatever dangers seem present in our world, the more we let God carry us, the more we fly through them and above them in safety. We associate more and more with the part of us that remains in God and rises above the difficulties of this world. "Surely you deliver me from the snare of the fowler, and from the noisome pestilence"
”The snare of the fowler” for me is what is often called the Inner Critic – the voice in your head, not necessarily audible! – that tells you you have got it all wrong. Or it could be the Inner Judge - the voice in your head, that keeps telling you all the ways in which someone else has got it all wrong. Both voices make for unpleasant thoughts! "Surely you deliver me from the snare of the fowler"
"I feel upset about something. On and on go my racing thoughts. They feel like bad thoughts, negative thoughts. I want to just dismiss them, but I don't seem to have the power to replace my thoughts with the thoughts that God would have me think." Great. If you see you don't have the power to change your thoughts this is a wonderful first step. Now you can say a prayer for peace of mind. Invite God to decide for you. Dear Holy Spirit, please decide for me. Wonderful. You are making a space in your mind in which God can work. At the level of health I was at, I often had to lie still for 50 minutes of every hour. Believe me, it was very important to find some way to discipline my thoughts and direct them towards inner peace. A good way to do this was to say psalm 91 as a prayer for peace of mind. I am repeating the bible verse to give you an idea of the persistence with which you need to repeat words that ask for what you want and replace the words in your head that ask for what you do not want. “The noisome pestilence” is interpreted differently in different versions of the Bible. Again I used this line as a prayer for peace of mind – peace from the unpleasant racing thoughts. I also had depression and I used both lines as a prayer for release from depression. So what do you do if it seems you don't have the power to quieten your racing thoughts? You remember you don't have to find peace on your own. You say a prayer for peace of mind to invite God to give you peace. When we pray Psalm 91 we do just that. We invite the Holy Spirit to enter our mind and bring us peace. The thoughts in my mind are not the ones I want. I don’t seem to be doing a great job of changing them. I am willing to think what you would have me think. You deliver me my God from the snare of the fowler. You deliver me my God from the noisome pestilence. The thoughts in my mind are the ones I want. I am thinking what you would think.